Which brings me to the accommodations in Prineville and the surrounding area. I would say the selection is average at best. So staying overnight is just a means to get an early start. 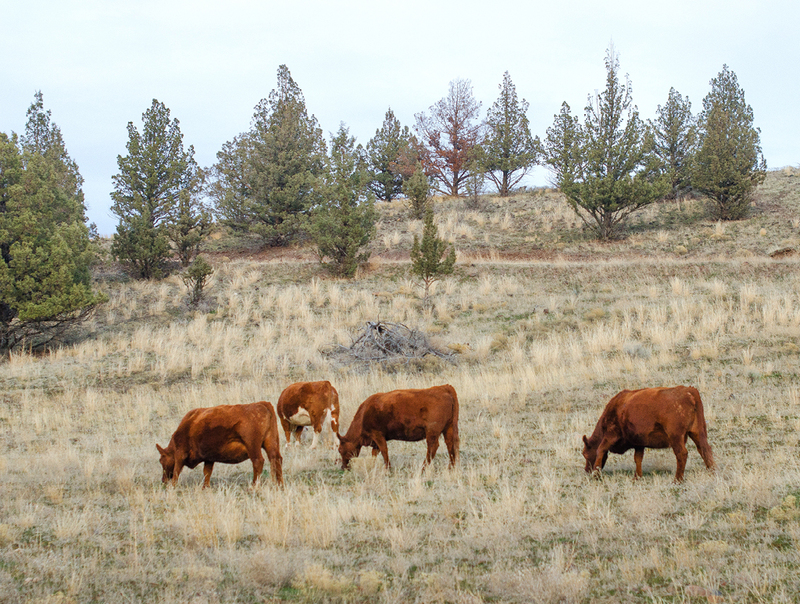 I would love to tell you about a nice little inn on the plains of central Oregon, maybe at one of the many ranches that dot the rough landscape. 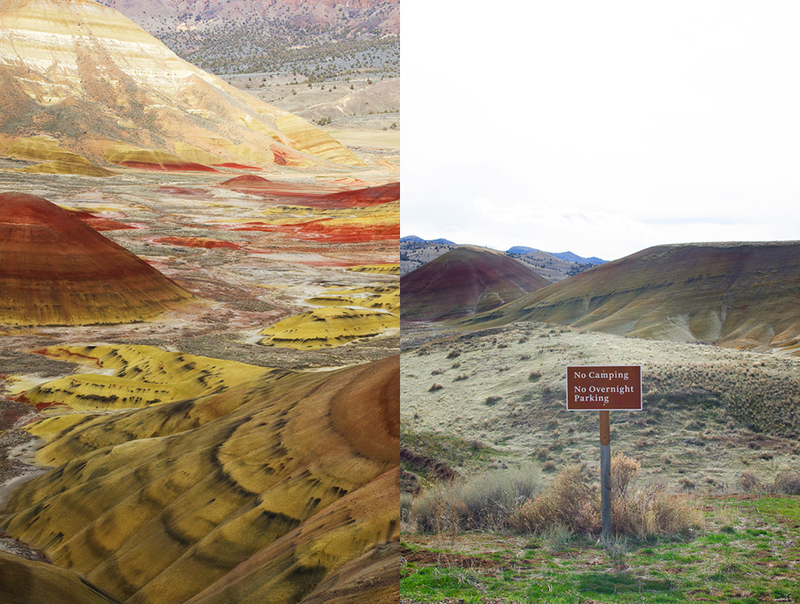 Well, if one exists in proximity to the Painted Hills it eluded us. 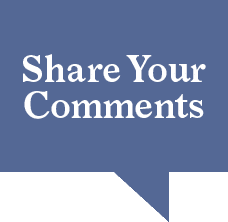 Maybe once Apple and Facebook come to town some other options will show up. Here’s hoping. 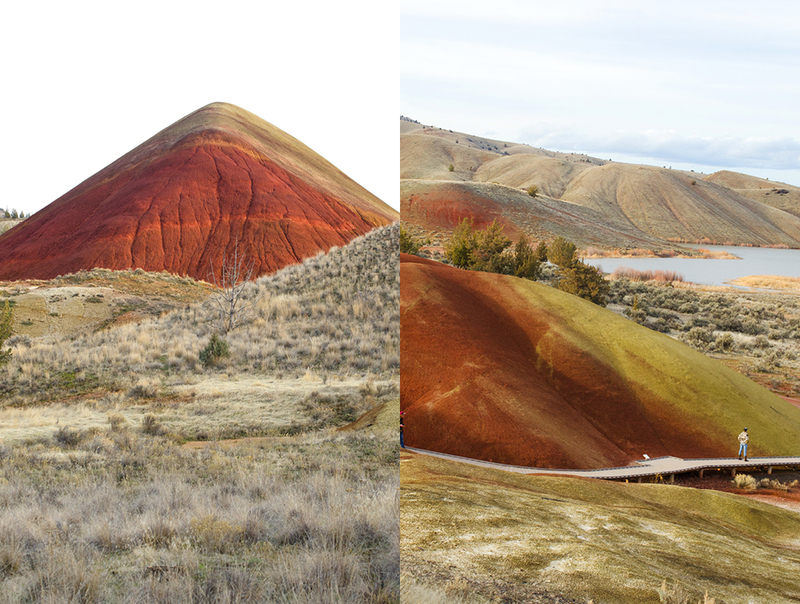 The hour-and-a-half drive from Prineville to the Painted Hills is quite scenic. 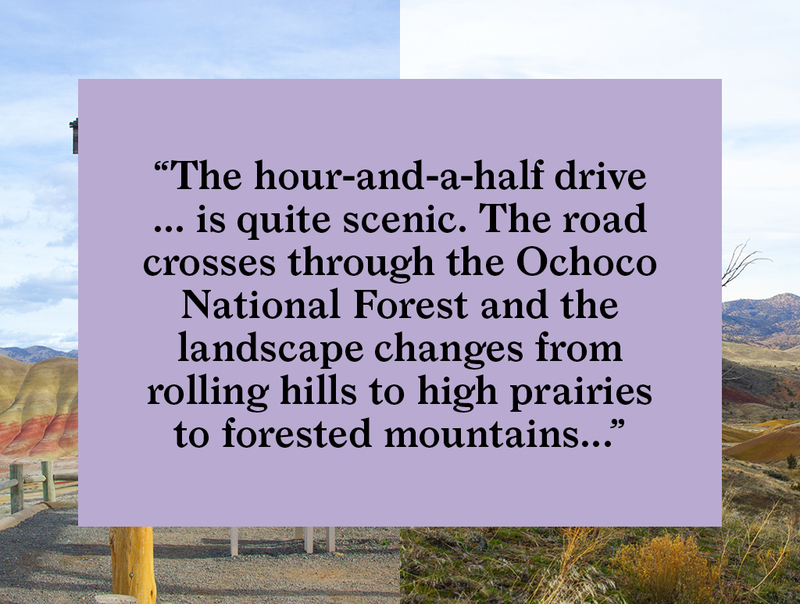 The road crosses through the Ochoco National Forest and the landscape changes from rolling hills to high prairies to forested mountains. We were fortunate to have had great weather and were treated to vistas of the wide-open landscape, grazing cows and skies dotted with puffy clouds. 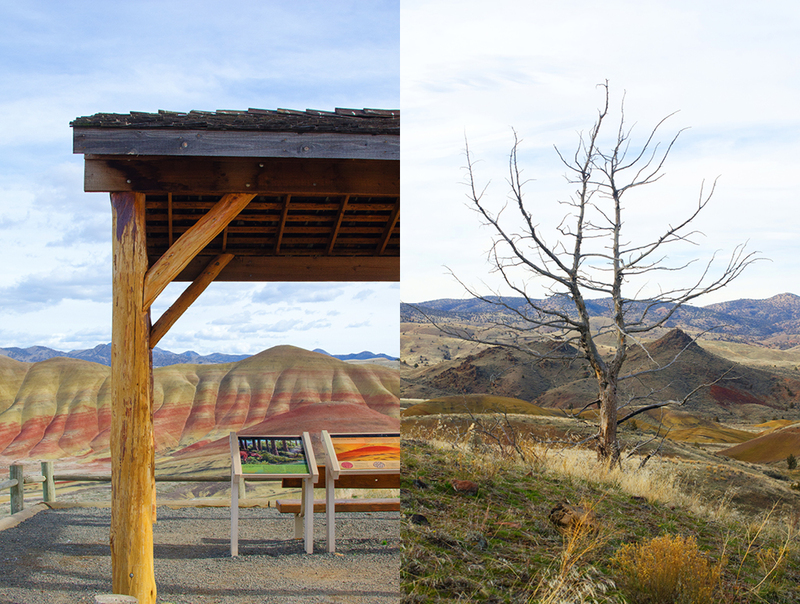 The Painted Hills is one of three areas that, together, make the John Day Fossil Beds. John Day was a hunter and trapper employed by the Pacific Northwest Fur company. Born in Virginia around 1770, he made his way west, becoming widely known when, along with his companion, he was stripped naked and robbed by Indians along the Columbia River. Shaken, the pair made their way a bit further west to Fort Astoria where the Columbia River meets the Pacific. Day supposedly suffered what we would now call now a nervous breakdown and stayed in the area for the next few years to recuperate. 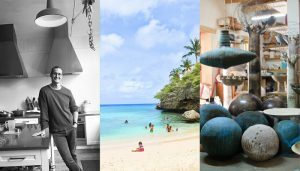 The story was widely covered in tabloids of the day making John Day somewhat of a celebrity explorer. 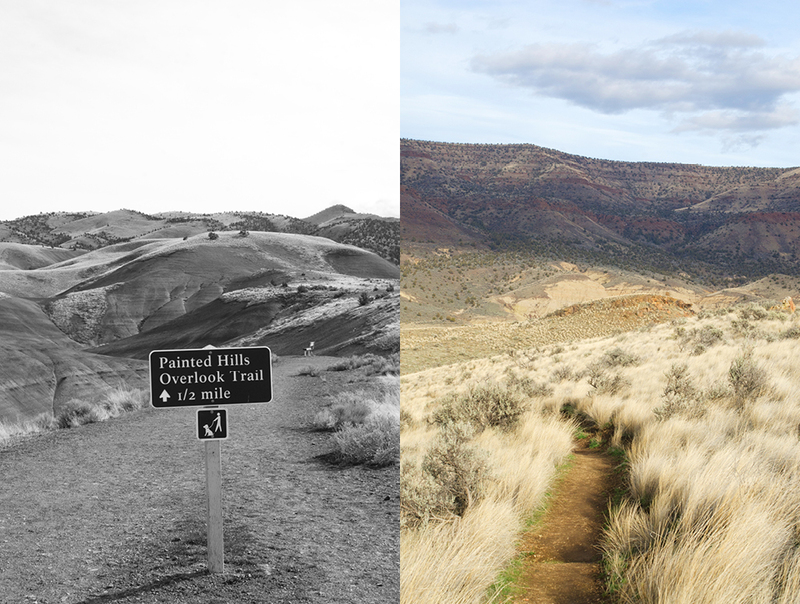 And his name was subsequently attached to the famous Oregon fossil beds and Mah-Hah River. 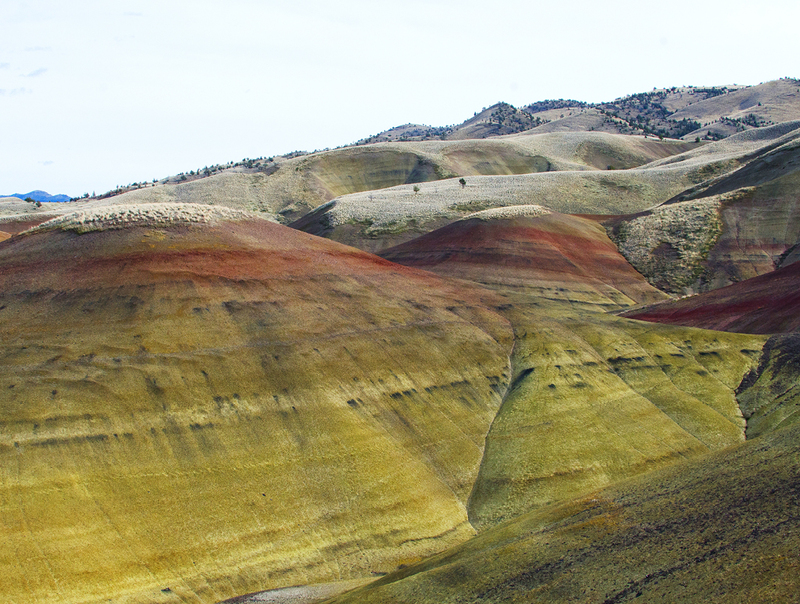 As you approach the Painted Hills you start to see small mounds colored in distinct layers of black, red and gray. I thought, “we have arrived!” But with no signs or anywhere to park, we kept driving. A bit further on we spotted some very “national park” looking buildings and a parking lot. “That must be it”. And soon we saw a small sign confirming that this was the place. Taking a left we entered the park orientation area, which is basically a restroom, and the only one for miles, so it’s worth the stop. Continuing on we slowly drove up a winding road between the first set of painted hills. This leads to a plateau lookout with parking so you can get out and take in the magnificent view. 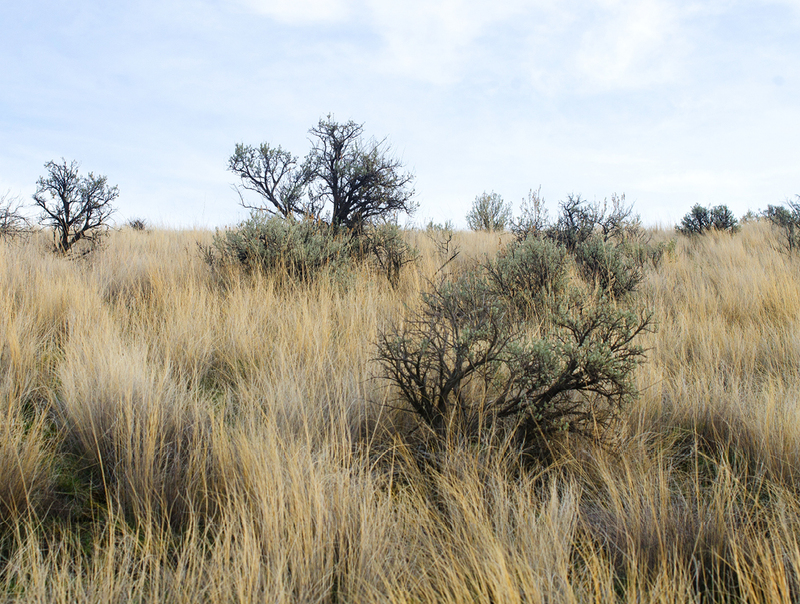 We walk up one of the small trails that start at the parking area and find our first great view of the twisting waves of red, gold and black, of these ancient river flood beds. 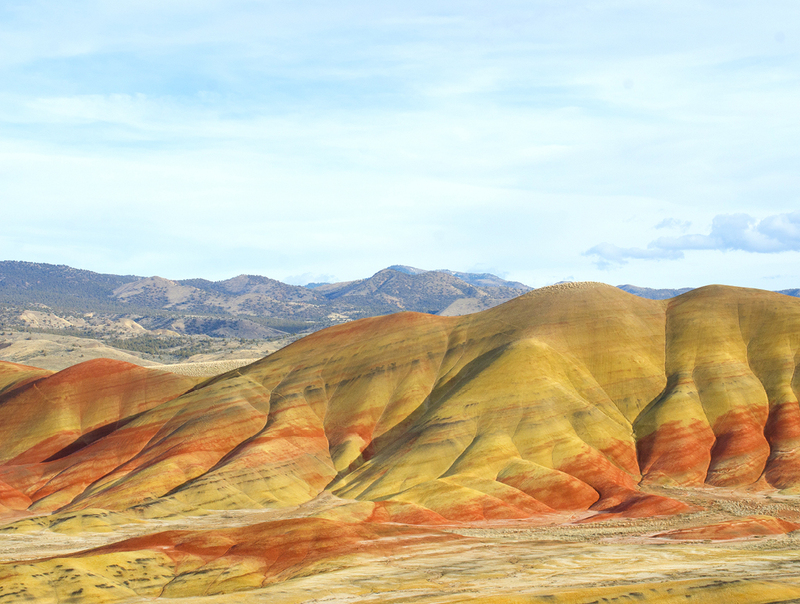 Starting about 33 million years ago, volcanic ash-fall from the ancestral Cascade Mountains settled in deep deposits, forming the colorful layers in these hills. 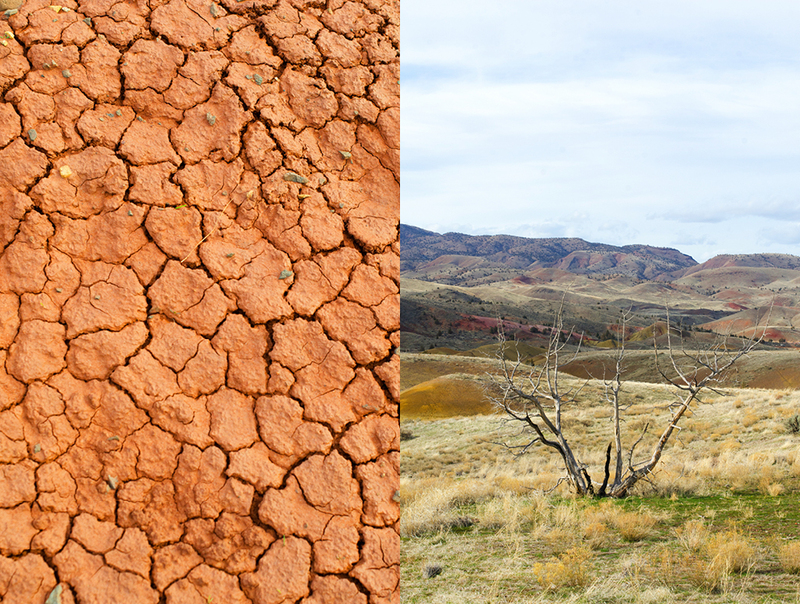 Natural processes changed the layers into bentonite, a type of clay which expands greatly as it absorbs water. When drying, the clay contracts, cracks and breaks up, giving the hills a “popcorn-like” appearance. The black soil is lignite, a vegetative matter that grew along the floodplain. The gray coloring is mudstone, oilstone, and shale. 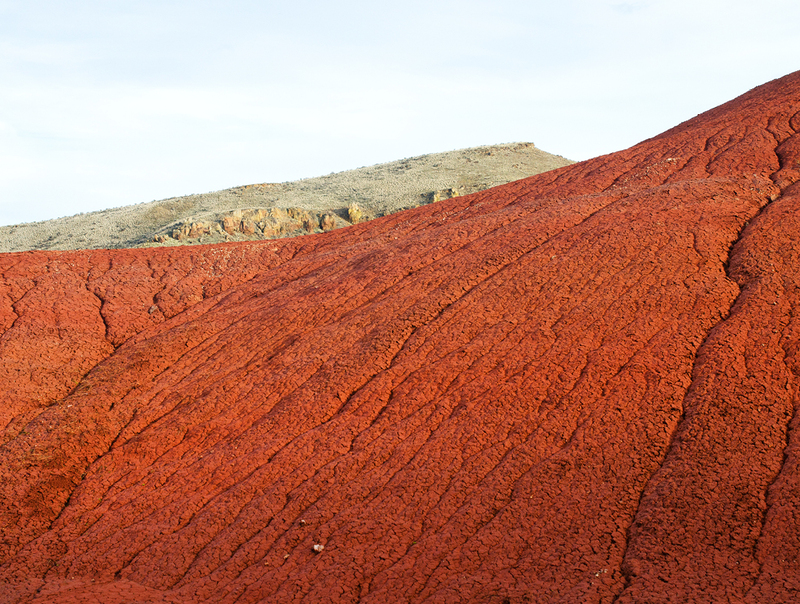 The distinctive red color is laterite soil that was formed by the floodplain deposits when the climate was warm and humid. 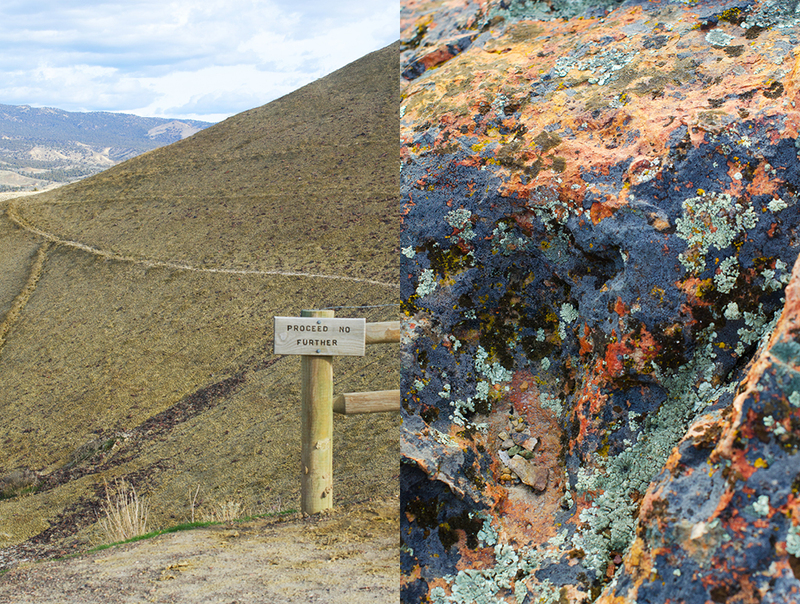 The area is of particular interest for Paleontologists, as an abundance of fossil remains were found in these hills. 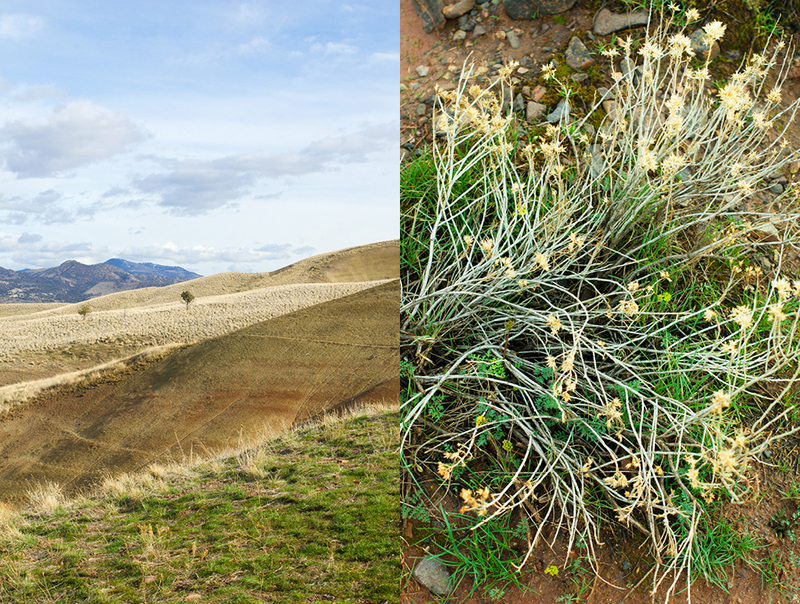 A myriad of now extinct plants, as well as camels, rhinoceroses, and early horses, have given scientists plenty of clues in their investigations of earth’s ancient history. There are five different trails starting from this lookout area. We suggest heading up the Carol Trim trail for the best overview of the area. It is a moderate uphill hike and you can do it in sneakers without any problems. Waiting at the top of the hill is the most magnificent view imaginable. If you time that hike for the late afternoon the light will be perfect. We scheduled our visit offseason, in February, so there were just a few other visitors scattered around the park. Most of the time we had the hills completely to ourselves to enjoy the absolute silence: all the better to imagine this magical place back when it was a tropical jungle frequented by all manner of strange flora and fauna. Just a short car ride further into the park is the trailhead for Painted Cove. 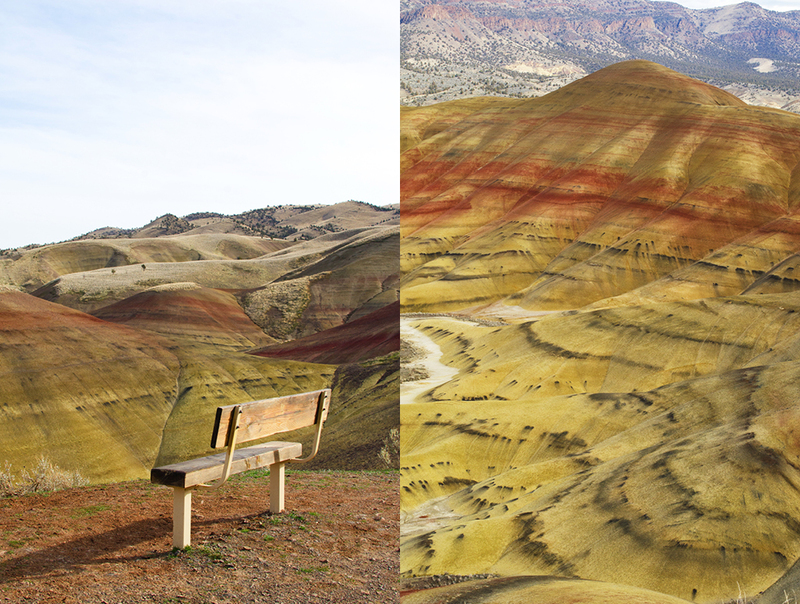 This is the only time you can get a close-up look at the Painted Hills. 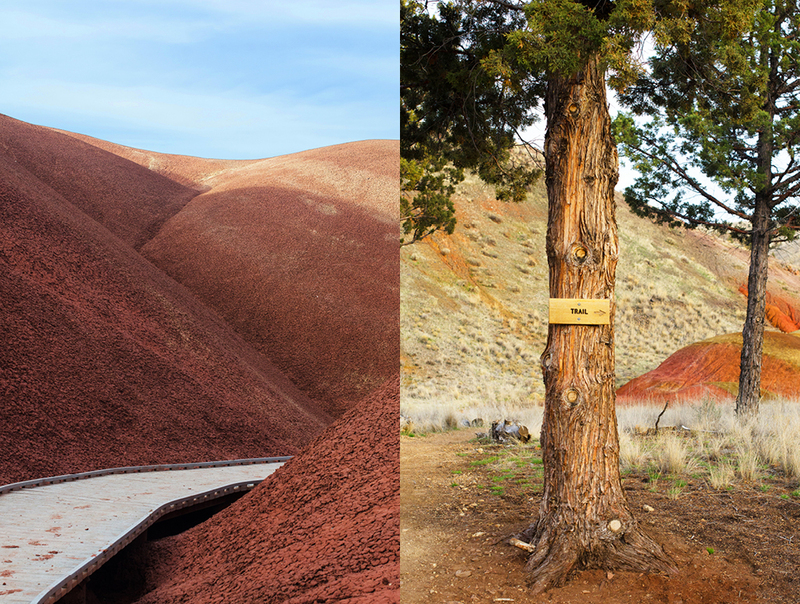 A wooden walkway leads you through the bright red mounds and up the hill from where you can get a better overview. 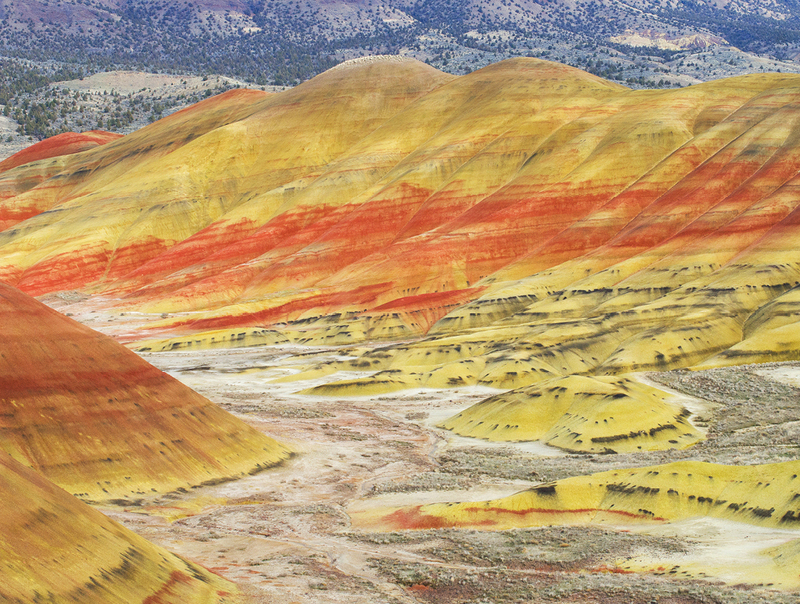 From above, the red hills look like a contemporary sculpture. Richard Serra’s large red colored steel waves come to mind, except this phenomenon had no author but nature. 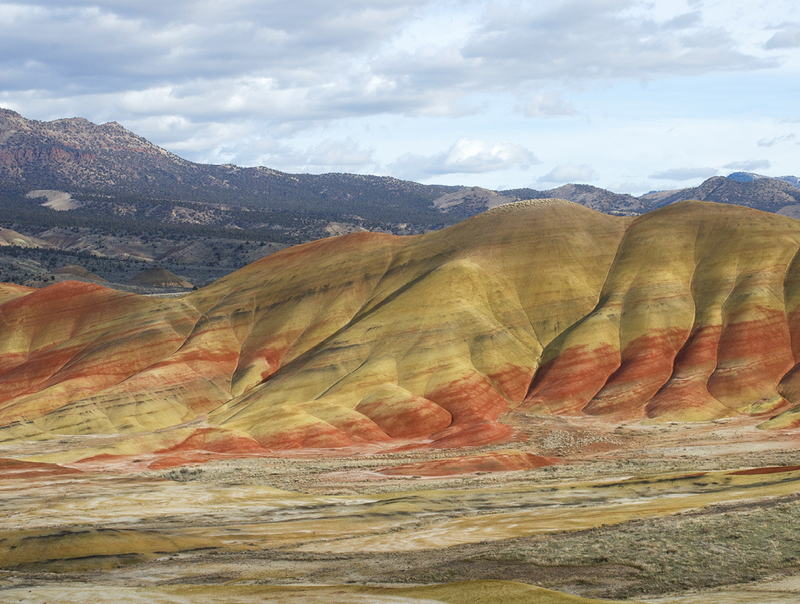 Nothing grows on these hills, the surface clay particles absorb rainwater so well that they expand and seal the ground so moisture cannot penetrate. The loose surface provides a poor foothold for roots, making it easy for plants to wash away in heavy rain. And the clay holds the water so tightly most plants cannot draw it out. 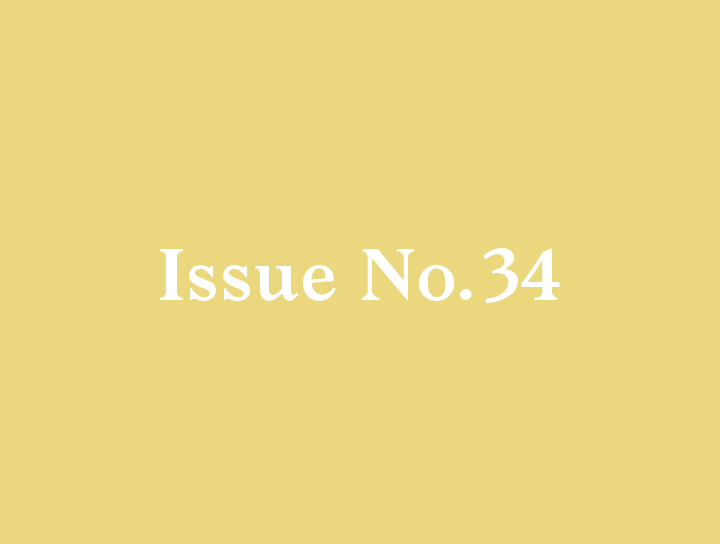 Beneath the surface, the clay is hard and impenetrable to a plant’s roots. 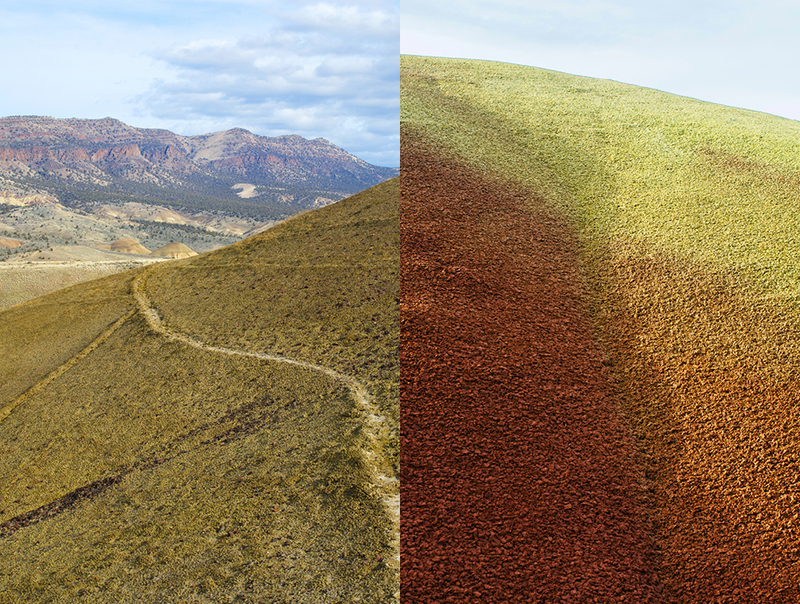 All this, combined with poor nutrients and hot dry summers, keep the painted hills consistently barren, much to our visual and photographic delight. 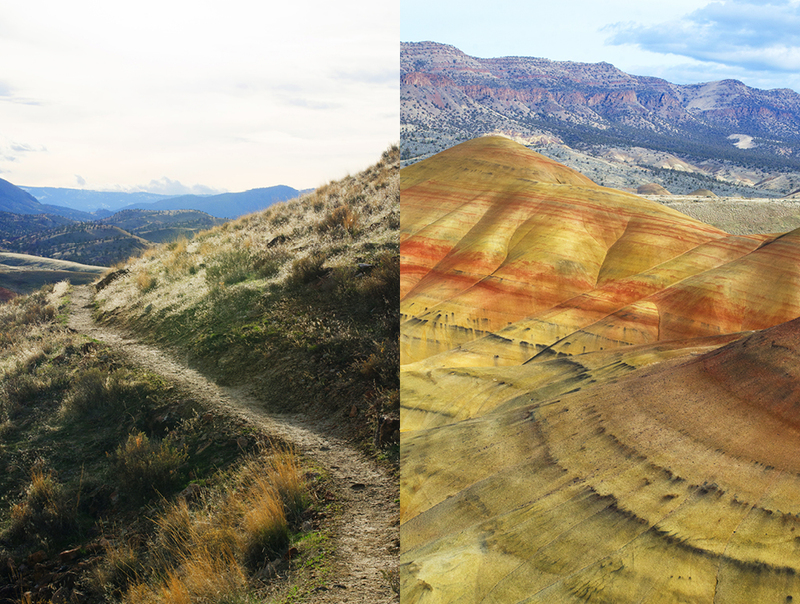 All in all, the Painted Hills is a great excursion and a really gratifying place to visit for its combination of great beauty, ancient history, and well-maintained trails. 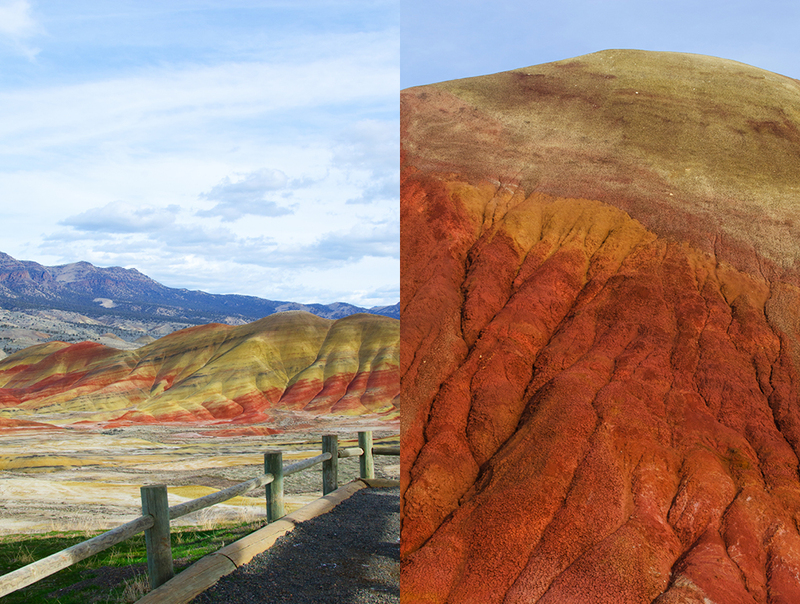 Planning a trip to the Painted Hills? Here is the current weather and what to expect for the next few days.